Now that we are well into the 21st century gardening, like agriculture, has seen an increasing trend away from spraying against weeds, pests and diseases as a matter of course and towards targeted ‘needs must; treatment. The destructive impact of over-spraying on the native flora and fauna has been recognised and in purely practical terms the range of chemical products available to domestic gardeners is now much reduced. 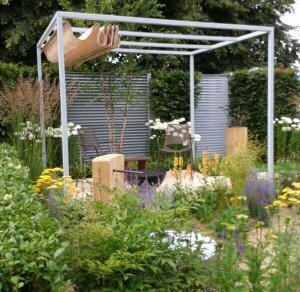 We are generally more aware of the importance of gardens to support wildlife and for many people watching and recording, especially birds and butterflies, adds another dimension of enjoyment to their garden. We are more conscious too of the need to make wise use of non-renewable resources and to reduce the amount of ‘permanent’ rubbish created, that will take decades or even centuries to bio-degrade. Gardeners of course have always recycled and composting must surely be the ultimate in recycling: literally turning old potato peel into new potatoes. A recent piece of good gardening news is that the long, hit-and-miss process of producing good quality peat-free multi-purpose compost seems to be bearing fruit at last with the introduction of products reliable enough for the large gardening organisations and professional growers to adopt. Maybe soon UK gardening will be peat-free and another endangered habitat will be reprieved. The growing understanding of how gardens and green spaces support our mental as well as physical health is a great step forward. Several reports published this year evidence the value of gardening for people living with physical and mental disabilities, poor mental health and dementia. Programmes such as the RHS Greening Grey Britain campaign are encouraging urban planting, school gardening and community allotments. It is nice to see some scientific research to support what us gardeners have felt for a long time. The internet, on one level so far from digging and planting, is now an integral part of the gardening industry as a source of information, ideas, inspiration and products. Possibly garden design has come of age as a result. Certainly there are still fashions in colours or the year’s ‘must have’ plant but we can style our gardens however we want from romantic and cottagey to sleek and contemporary, traditional or influenced by holidays abroad, with a vast array of plants and sundries to choose from. On balance I think that choice may be the defining characteristic of 21st century gardening. What about you?